We always read about that china is now running an economy based on bubble and that bubble burst might disrupt the economic growth of the world economy. Apart from its super GDP numbers growth and mounting assets prices China is internally very strong in terms of attracting overseas investments through all channels. Moreover the returns generated by the overseas companies’ investments in china are fetching healthy numbers of growth. • According to data recently issued by the American Chamber of Commerce in China (AmCham-China), 71 percent of U.S.-funded enterprises in China generated profits in 2009. Around 76 percent of them have had higher profit margins than their average global profits. • But due to the global turmoil of 2008 their have been quite significant drop in the investments in china by overseas routes. • According to a report issued on Jan. 19 by the United Nations Conference on Trade and Development (UNCTAD), the foreign direct investments (FDI) around the world tumbled by nearly 39 percent in 2009. Of which, FDI was down over 41 percent in developed countries and about 35 percent in developing countries. • In 2009, FDI in China dropped only less than 3 percent. Since August 2009, foreign investments in China have maintained a continued, positive growth. • Investments in China plummeted not only due to the global turmoil but due to china’s economic policies. But now we are witnessing some problems from china regarding the overseas investments. • Currently Chinese regulations of foreign investments are damaging the investment growth in chain and due to this foreign enterprise is facing lot of problems. But china is backing up again and is very much active on the ladder on drawing attention of foreign investments. the most essential reasons behind the high profitability growth of investment through FDI route followed with the investment confidence among foreign enterprises lies in the fact that China is constantly rolling the wheels of improvements in China's investment environment and the lowered transaction costs for foreign investments. 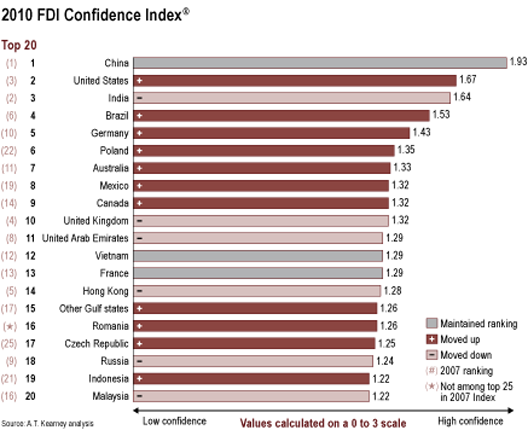 The below Chart shows the FDI index of the world'd top 20, where China is maintaing its growth journey. China enjoys the factors of cost competitiveness in areas like as labor, resources, land and environment. 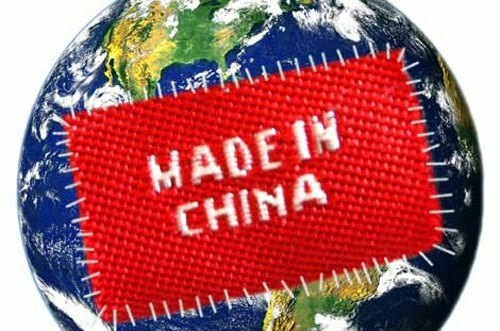 In a very recent note by The State Council clearly stated that in the "Several Opinions on Better Utilization of Foreign Investments" issued on April 6 that China will expand the areas that are opened to foreign investments, optimize the industry and regional foreign investment structure and enhance the investment and management efficiency in order to foster a sound investment environment. It clearly point outs that china will surpass and design policies to break all the figures of its past FDI investments in china. When china opened up the doors of foreign investments till then and now the government have changed and reformed the polices almost more than 5 times. But their have been certain problems regarding value of customs and ethics of china. Respecting China's laws, customs and culture is the most basic business ethic for foreign enterprises and this part is often gets some small tremors which disrupts the chinese state ethics. Apart from the investments, china is improving the manpower quality and research & development is also happening at rocket speed so as to meet the rising the demand of professionals. We only read of Chinese infrastructure, telecom and other sectors super growth but do we read about that the quality of manpower and professionals required to support the economic growth of china. Moreover to roll over the wheel of development in any economy research and development plays one of the most momentous characters. • China has nearly 1.6 million young engineers (those with seven years of experience or less), which is a tremendous advantage in its drive to make a transition from a labor-intensive economy to one based on high technology. • China currently spends 1.5 percent of its GDP on research and development versus 2.7 percent spent by the United States. While this is more than any other developing nation, it still falls short of being adequate to ensure future competitiveness in high-tech fields. 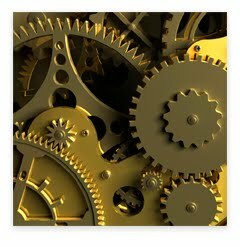 • More and more foreign enterprises are establishing R&D centers in China to take advantage of cheap Chinese engineers. They can pay on 700 U.S. dollars a month on average for a Chinese engineer, which means they can hire four to five engineers for the price of one American. • This cheap valuation of chinese manpower have also compelled the citizens to leave china and work in other nations. • Now china is working hard to bring those talent back in to their country. China has introduced a number of policies designed to reverse “brain drain and bring back the talents to their own country. It seems that this resource is not being utilized enough by China. One way to make better use of China’s youth would be to increase government spending on research and development, creating more high-tech jobs. Statistics show that nearly 60 percent of young Chinese engineers have difficulty finding jobs after graduation. China is looking in all respects to make its economy beyond the word of super power. When other nations are busy in collecting its fragmented economic health China is setting up the wheel of development for the coming decades. China is looking into the core areas of economic growth and not building an artificial economic growth based on reckless lending and speculative dreams. The European economies were very happy after getting the bailout of around one trillion dollars. Its was enough to buy up the debts and save the economy from the verge of death. The world stock markets were happy and were celebrating Christmas due the revival package poured in to the cup of Greece and other European debt burden economies. But I am sorry to declare that Greece followed with other debt burden economies of Europe will have to again count for restructuring of its Debts. Currently the debts of Greece alone stands at 115.1% of the country's gross domestic product The bailout will further spook up the debts to 150% of GDP by 2012. That might frighten up any economy which plans reap the benefits of investing in low growth economic growth of Europe with future gold mine eyesight. Moreover Greece will need to renegotiate the bond holders who are on the verge of getting materialized. Either Greece will go for lengthen the time frame of restructure will ask them to settle for less amount. So another trance of crash is expected in the bottom-line for correction of bond market once any of the two happens with a severe blow up if the loss acceptance takes place by the bond holders. If we look historical numbers of bond defaults keeping the recession of 2008 out of books then we get that in late 2001 Argentina defaulted on $82 billion of debt and investors recovered just 30% of their money. In another case Russia's debt fault in 1998 and later on default recovered about 50%.I don’t need to dig further as its well clear that the chances of recovery remains very fragile and low intended. Another wheel to add up to the Greece debt restructuring is the flow of funds which will be required to pay for the daily operations of government, like salaries for government workers. Don’t mingle up that the funds of bailout will use to settle the debts and not to pay salaries and Greece domestic benefits. In fact, in 2009, the country was already €20 billion in deficit before it went out for interest payments. The country's interest payments are growing each day.. In 2012, Greece will be paying out €17.1 billion, up from €11.9 billion last year. In 2014, when Greece's debt is projected to peak at €353.8 billion, it will pay €20.4 billion to creditors. The numbers might make you puzzle but one needs to make a cautious outlook on the economic prospects which reflects that Greece and other European nations have less avenues to generate revenue and pay of the debts much faster as it was thought. The IMF projects Greece will need to borrow €70.7 billion and will have €265 billion in debt to the private sector—about where it was in 2009. 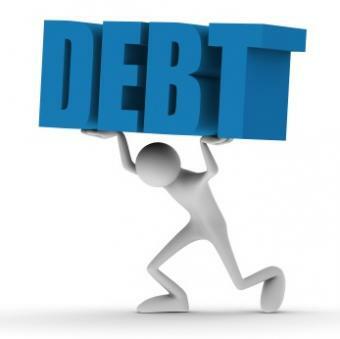 Greece is now planning to privatize the state assets so as to reduce the debt mountain. Something likes disinvestment policy of India. The country is also filled up with problems of malpractices and its seems that they are on the top of the cliff. This have now forced the finance ministry to start a broad investigation of tax and customs officials, after receiving a string of complaints over alleged bribery, forgery and smuggling. The ministry said it had even located 234 tax workers who failed to file income tax declarations in 2007 and 2008. · a crackdown on income tax evasion. Every economy of Europe is now taking active measures to avoid the sleepless nights like Greece. To cut short Greece have no other way rather than going for restructuring its debts. We will have to wait for the next round of nightmares coming any time soon. According to CII the capital goods and consumer durables pushed up the performance of the manufacturing sector in the second half of the year 2010. · Import of capital goods increased from Rs 83,424 crore in 2004-05 to Rs 2,61,311 crore in 2008-09, the year whose latter half saw the worst effect of the global meltdown. · The steepest hike in import was that of electrical equipment (42% in 2008-09). · While domestic demand is the principal driver of expansion in capital goods sector, in a slew of sectors like textiles, chemicals and food processing, export demand is also a major factor that spurs investment. · India have raised huge amount of funds to finance imports of capital goods. · Through external commercial borrowings (ECBs) last fiscal (2009-10). Companies received approvals to raise $21.67 billion compared with $18.36 billion in 2008-09, an increase of 18%. · According to RBI data for March 2010, as many as 73 companies have opted for ECBs. · In March 2010, companies raised $4.32 billion, up 300% over $1.11 billion mobilised in March 2009. · Among all these who raised capital through overseas route includes some top players as well as midsized firms too. · RIL raised $800 million in two tranches through the automatic route for refinancing debt, National Aviation Company (Nacil) which operates Air India, raised over $855.50 million for ‘‘import of capital goods’’. · Telecom players Aircel and Reliance Infratel (R-Comm's tower business) raised $300 million and $250 million, respectively during the month. Aircel Cellular raised another $100 million through the approval route for import of capital goods. · Dishnet Wireless and Power Finance Corporation (PFC) raised $350 million and $300 million, respectively in the month. 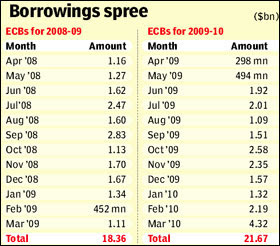 The below data shows the amount of borrowings being executed by India via ECB in 2008 and 2009 fiscal years respectively. The flow of ECB and other sources of capital in the capital goods sector reveals that investments for expansion of manufacturing is happening at a robust speed.This also reveals the demand which lies in the womb of future of Indian economy. CMIE's CapEx database reveals that Indian corporates continue to announce fresh projects, even after commissioning huge capacities in the last few years. Projects worth Rs 6.5 lakh crore are scheduled for commissioning in 2010-11. This figure stood at Rs 2.3 lakh crore in 2007-08, Rs 2.9 crore in 2008-09, and Rs 4 crore in 2009-10.The flow of funds will be never ending and the demand is driven domestically despite of global export slowdown from Indian perspective. The chief growth driver is increasing demand, impelled by a sharp rise in corporate wages, salaries of government employees, and income of the farming community. But now after the debacle of Eurepean nations India needs to adopt a wait and watch policy to decided the future demand. We should be in such a position where India makes an accumulation of huge amount of expansion tools and later on suffer with over capacity due to global conditions. Any downward trend in this segment reveals that the demand for the industrial growth of India is poised to some uneven threat or an anticipation of major crisis which will slow down the demand globaly. Similar threats were noticed in the first half on 2009-10. Moreover the demand domestically took an upward surge due to low taxes and fiscal stimulus provided by the Indian goivernment during recession times. · But now the senario is changed and we need to take cautious steps.We might not be able to post similar growth numbers in the coming quarters since the stimulus have been rolled back and “Left Out” global conditions are very much turbulent. · The coming days the indian capital goods sector might face some hard days since other recession affected economies are coming out of the clouds and are throwing down invisible challenges of export competetion primarly through currency valuations. The small and medium sized companies are now very much active on the martahon of Indian economic growth dream of 10%. MSMEs (Micro, Small and Medium Enterprises) to import technology and equipment from USA.Even the Export Import (Exim) Bank of India has signed a Master Guarantee Agreement with the Exim Bank of USA. According to the study by the Federation of Indian Chamber of Commerce and Industry (FICCI), India's exemptions from import duties for various projects have led to over five times increase in capital goods imports from $ 6.5 billion in 2003-04 to $ 30 bn in 2008-09. The government very recently have been requested by he Federation of Indian Chambers of Commerce and Industry to formulate rules for the import of second hand capital goods and make those accessible to the industry. The next demand for the capital goods segment depends upon the blessing of Lord Indra.If India meets the target of rainfall and adequately within time then the sector will be able to witherout the dark clouds of global debacle. If this happens Indian economy will be able to achieve the dream figure of double digit GDP growthin 2010-11. Can any economist or any financial guru from the world forum can explain that how many times the trillion and billion dollars will be used to buy the defaults. We spent trillion dollars tax savers money to Buy Smile on the face of world financial markets. By this time you read this you must have witnessed the Big Smile across the world stock exchanges. We purchased this “SMILE” by spending a trillion dollar .More surprisingly I found that many economist and financial analyst and market speculators are cheering that a part of this trillion dollar will now flow to emerging economies like India and China. The end result of the inflow of this part will soar up the prices of the stocks. We are not making rather less interested to form any financial policies which will protect and stop further happening of the stories like Greece. US buyout is now old story to many of us. But, what about the future nightmare stories? Today one is transparent to understand that the entire world economy and financial system is based on speculation .Speculation build and stood and stand on dreams of speculations. I am not ashamed to address all my readers that we are every time we are turned out to fools. We are making money and profit at the cost of some other economies. This is not an inclusive world economic growth. International Financial bodies are now appearing like those parents who are never scold or control their prodigal child’s activities. Moreover it tries to cover up the mistakes of its prodigal child and ask indirectly to commit more financial nuisances and foul plays. Rule and regulations are now appearing as words on paper and records in websites archive list. As a child has parents which included one father and mother, likewise the huge debt of Greece took birth in the same fashion. • The country is, in the argot of banking, too big to be allowed to fail. Greece owes the world $300 billion, and major banks are on the hook for much of that debt. The bankers from Wall Street enabled Greece and others to borrow beyond their means, in deals that were perfectly illegal. The below image is taken from New York Times which depicts the web of loans among Greece and other nations in Europe. Now a question might come up how politicians and others masked the cash lending’s and never recorded them as loans. The ans some where lies within the European countries mind set. The Europeans have never, to this day, been willing to accept the consequences of this assertion of unity. They wanted a single currency but refused a common fiscal policy that could keep the books balanced; they wanted a common flag but rejected a Europe-wide Constitution; they desired the benefits of community but not its limitations or responsibilities. According to Garry Schinasi, a veteran of the International Monetary Fund’s capital markets surveillance unit, which monitors vulnerability in global capital markets said “If a government wants to cheat, it can cheat. Banks have been exploiting these European countries against a fee for arranging the transaction of loans to cash lending ,Greece have paid $300 million in fees for arranging the 2001 transaction, according to several bankers familiar with the deal. If we look in to some of the historical data related to loans to Greece and other nations we find some interesting facts. In 2001, just after Greece was admitted to Europe’s monetary union, Goldman helped the government quietly borrow billions, people familiar with the transaction said. That deal was hidden from public view because it was treated as a currency trade rather than a loan. This also helped Athens to meet Europe’s deficit rules while continuing to spend beyond its means. The world was fooled at that point of time when the Europe was spending and its consumer price index and other economic gauges were showing growth and investment opportunities to the world market. Where in real terms the economy. was getting eroded with mounting debts. The fear of the fall is not yet over even after the trillion dollar spend to buy the debts. Since the biggest reason for the fear is the investments made directly and indirectly by the world market in European nations. So now its well clear that how Greece and other European nations gave birth to the huge deficit with. It might come to my readers mind was their any foul play by the Wall Street. Diplomatically saying yes. Wall Street was against of the euro. Euro helped the European economies followed with Greece Italy Spain etc to come under one exchange only to hide the rising fiscal deficit at that point of time. Currency was one but unity was never their and no common flag. If Indian context one wants to understand this its like each state in India having a different flag and government with respective prime ministers but with one currency. Each and every state acting independently. But the next thought we should think that today world is smiling at the cost of trillion dollars of tax savers fund and how much more smiling will be required to buy spending further trillion dollars . When this trillion dollar will winded up, the real picture of the world economies will come out of the woods. Many of the fools among us might say that who have seen the future regarding what will happen at that point of time. Now I am sorry to disappoint all of them by saying that those who were in the holy process of creating this turbulent economic and financial condition and having similar thoughts regarding the future foresight are now a part of the writing the history of trillion dollar Smile. What we need and how to protect the future, I leave this to all the speculators who are again busy for another round of show of high growth build on speculation. Only advise I will like to pass on to my speculator friends is that you please understand that tomorrow always comes and your speculative hard earned money is the next bait to get eroded if you don’t stop speculation..You need to formulate policies to protect your misfortunes. In the future again we will see that such loans will be arranged without making proper records and even asking them up from the people and world. All we need stringent global rules and regulations to control the global financial market as well as abide by them. Today the world economies financial market is not having a particular epicenter. Its now a global epicenter of financial market.